It’s Just Not Cricket! | What I think About When I Think About Writing. Have you ever watched a sports event and wondered if what’s happening on the pitch or field is all down to the players and elements of chance? Have you ever thought that someone down there knows more than they should or has an unfair advantage over their opponents? Another question to ponder: Is the sportsman/woman in it for the glory of their team or are there more sinister motives abound. Cheating occurs in all falls of life; in relationships, in work, at home, and in sport. There is money to be made if you play professional sport – loads of money. Just ask Tiger Woods, Brett Favre and any Barclays Premier League footballer. But what if you decide that you can earn more money by fixing a result or manipulating events on the field? I’m not just talking about doping; I’m saying that businessmen all over the world, particularly in the Far East, use middlemen to approach sports stars, tempting them with vast sums of money if they influence a game. The British Sunday tabloid, News of the World, is an expert in setting up such stars. You could call it entrapment, but it highlights the greed of some of the world’s biggest stars. Former world snooker champion John Higgins is suspended indefinitely from the sport because he stands accused of “throwing” frames during a tournament. Yesterday, the tabloid released a video of one such middleman accepting a substantial sum of money, saying he could guarantee when a “no ball” would be delivered during the Fourth Test between England and Pakistan. Events, innocuous in and of themselves, occurred as planned, thereby highlighting the case that if small things like that could be fixed, the overall match result could be in doubt. The man was arrested (he is currently on bail); England won the game and the series; but the result is tarnished. This game – any game – becomes pointless to watch if players fall foul to betting scandals and match-fixing allegations. 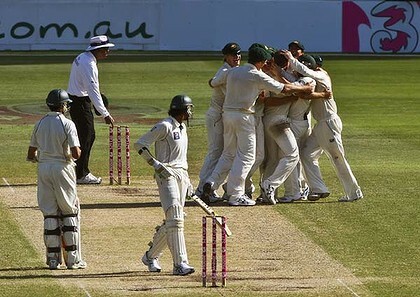 Cricket has been “knocked for six”. This entry was posted in Sports and tagged Cricket, England, Far East, John Higgins, Match fixing, News of the World, Pakistan, sport, Tiger Woods. Bookmark the permalink. Excellent post, JM. I could NOT agree with you more. It’s funny, watching The Barclays yesterday, Martin Laird managed to lose by such a narrow margin (with such WIDE putts) without seeming upset by the loss.